In the wake of the Arab uprisings, the Tunisian Islamist movement al-Nahda voted to transform itself into a political party that would for the first time withdraw from a preaching project built around religious, social, and cultural activism. This turn to the political was not a Tunisian exception but reflects an urgent debate within Islamist movements as they struggle to adjust to a rapidly changing political environment. Drawing on extensive fieldwork, Rory McCarthy explores the lived experience of Islamist activism to offer a challenging new perspective on one of the Middle East's most successful Islamist projects. Original evidence explains how al-Nahda survived two decades of brutal repression in prison and in social exclusion, and reveals what price the movement paid for a new strategy of pragmatism and reform during the transition away from authoritarianism. Rory McCarthy is a fellow of Magdalen College, Oxford, where he is working on a project about the politics of protest in the Middle East after the Arab uprisings. 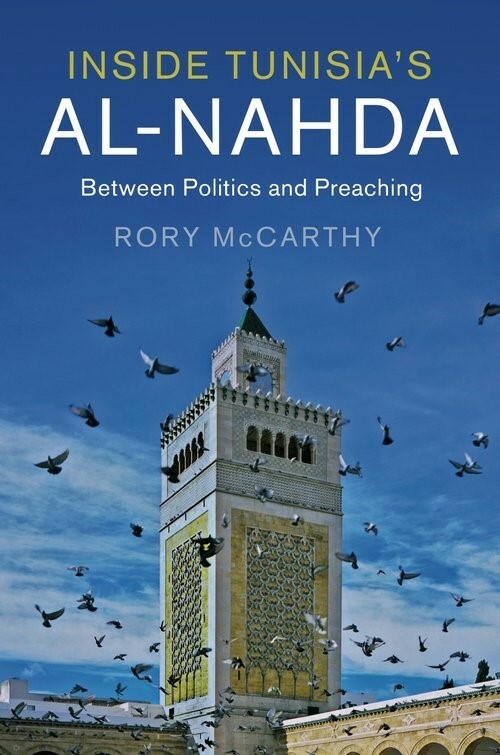 His new book Inside Tunisia's al-Nahda: Between Politics and Preaching comes out in 2018 with Cambridge University Press. Rory is also the author of Nobody Told Us We Are Defeated: Stories from the New Iraq (Chatto & Windus, 2006) and co-edited Civil Resistance in the Arab Spring: Triumphs and Disasters (OUP, 2016). He spent a decade as a foreign correspondent for the Guardian, with postings in Islamabad, Baghdad, Beirut, and Jerusalem. He has a BA in History from Cambridge and an MPhil and DPhil in Oriental Studies from Oxford. Current Teaching: I teach the Politics in the Middle East option to PPE undergraduates and in Hilary Term 2018 I’m teaching the Politics in the Maghreb option for the MPhil in Modern Middle Eastern Studies. 'When Islamists Lose: The Politicization of Tunisia's al-Nahda Movement', The Middle East Journal (forthcoming). 'The Tunisian Uprising, Ennahdha, and the Revival of an Arab-Islamic Identity', in Holliday, S. and Leech, P. (eds. ), Political Identities and Popular Uprisings in the Middle East (London: Rowman & Littlefield International, 2016). 'Protecting the Sacred: Tunisia's Islamist Movement Ennahdha and the Challenge of Free Speech', British Journal of Middle Eastern Studies, Volume 42 Issue 4 (2015), 447-464. 'Re-thinking secularism in post-independence Tunisia', The Journal of North African Studies, Volume 19 Issue 5 (2014), 733-750.